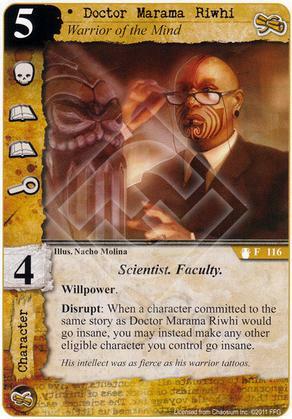 Flavor Text: His intellect was as fierce as his warrior tattoos. How bad was the Shadow of the Monolith set? I'm not using a single card from it. Take The Doctor here - not even close to par for a 5-cost character. I can't even say it's a really old card that just became obsolete- this card was never good. I guess the Ancient Relics block used up all their awesomeness on the Relics. It has a couple that almost look playable, a couple that I have actually seen in other players' decks (eg Wooden Homunculus, Naval Tactics). But I don't think I have even opened my packet, meaning that not only am I not using any of its cards but I never even seriously considered using any of them. I agree there are a couple cards in SotM that could fit in the right build. I think the cards are all just so niche that there aren't many decks that want to use them. It's telling that you and I aren't using any of the cards, and I'm curious if anyone would be eager to honestly pound the table for any of them. Just a throw-away pack I guess.